Carl Sagan was an inspiration to a generation of astronomers, skeptics, and just average folks. He was able to take the beauty, complexity, and breath-taking awe of the Universe and bring it down to us, show it to us, and make us understand it. If ever there was a guy who deserves to have a stamp commemorating him, it is Sagan. 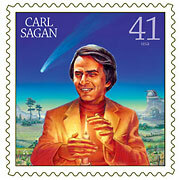 Cornell University, where he worked for many years, is unveiling four different stamps in honor of Sagan. My favorite is by my friend Pat Linse (she does the artwork for Michael Shermer's Skeptic magazine). It shows Sagan's twin passions: astronomy (the comet) and critical thinking (his masterpiece book The Demon Haunted World was subtitled Science as a Candle in the Dark). The official unveiling to the public is February 28, and when I learn more about how we can help the US Postal Service adopt these stamps, I'll post about it.